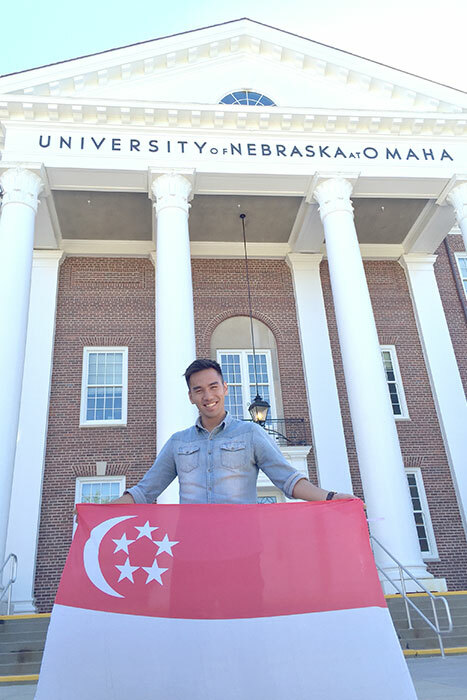 Flying the flag for Singapore in the United States at the Fall 2016 YSEALI. Justine Lee is a bright young man whose life exemplifies Psalm 1: whatever he does seems to prosper. A co-founder of the award-winning social enterprise Soule, which donates shoes to needy children for every pair of footwear it sells, Lee is also a cell group leader in City Harvest Church and currently a Master’s degree student. CITY NEWS WEEKLY: How did Soule grow from a simple idea to the award-winning brand it is today, and how do you sustain the business? From the start, my team and I decided not to just chase after financial profits, but to chase that eternal reward and God’s calling for our lives. Gaining wealth was not as important as finding out God’s plan for Soule and what He wanted us to do with this business. We just saw it as a platform to serve God and people. God has been good and has always provided for us. To the world, it may seem foolish that a startup company would choose to commit a significant percentage of profit to social causes rather than keeping it in the business. Year on year, we grew and God has blessed us not just financially but with favor and relationships. And I have come to realised that the latter of these bring much greater joy to us than the former. We all have the responsibility to be good stewards of our God-given talents and to multiply it by impacting the lives of others and living a legacy. True success is not measured by what you can get, rather, by what you give. Because at the end of the day, people will remember how you made a difference and how you made them feel. Justine representing the Citizen Ambassadors to present ‘Building a Better World’ Commemorative Book to President Dr Tony Tan. How did Soule get involved with the Singapore International Foundation? In 2010, Soule was shortlisted and chosen to be a part of SIF’s Inaugural Young Social Entrepreneurs (YSE) Programme, which brings together local and international youth social entrepreneurs to network and compete for grants and investment. Our team had a chance to pitch and present our social enterprise in front of a panel and audience. We emerged champions that year and that served as a launchpad for our business. Because of that award, we garnered the media’s attention and had favor with the networks we built. Over the years, we have kept our partnership with SIF and contributed back by mentoring and giving talks to following batches of YSE. Our team has also worked with SIF to strengthen foreign relations and raised awareness about Singapore’s social entrepreneurship scene during a Journalist Visit Programme (JVP) where we hosted two groups of journalists from China. Because of our contribution of time, skills and expertise to communities locally and abroad to effect change, the founders of Soule were recognized as Citizen Ambassadors. 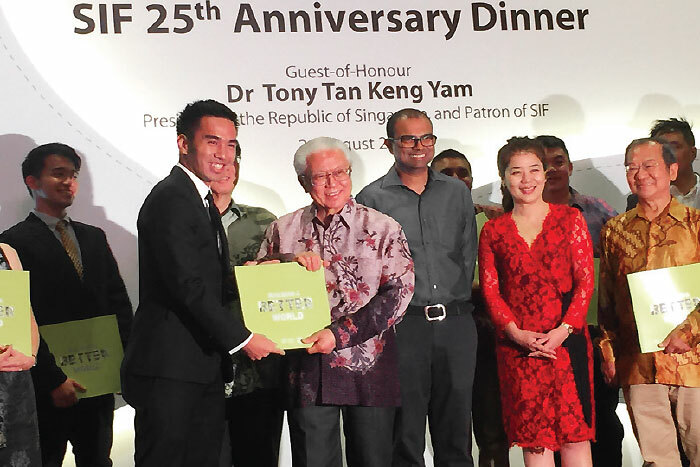 I was featured in SIF’s 25th Anniversary Commemorative Book, and invited to present the book to President Dr Tony Tan during the Anniversary dinner. You recently participated in President Barack Obama’s Young South East Asian Leaders Initiative in the US. Tell us about it. 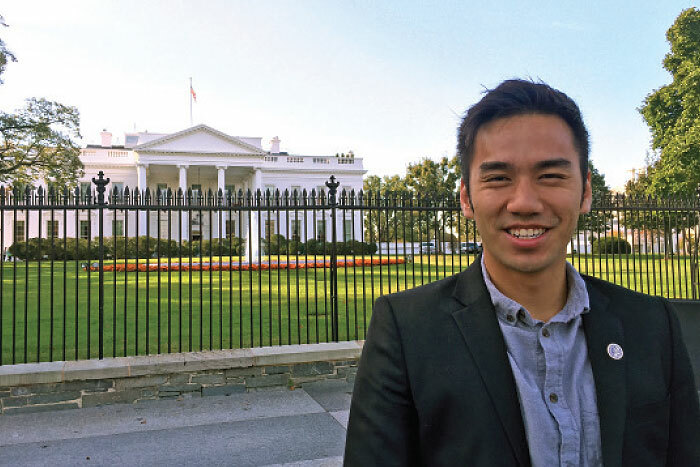 YSEALI was piloted by President Barack Obama and coordinated by the US Department of State. It is the US government’s signature program to strengthen leadership development and networking in Southeast Asia. Every Spring and Fall semesters the US Embassy across the 10 ASEAN countries would invite applications for this Academic Fellowship and select high potential young people with strong leadership qualities and track record in their academics, work and community. I applied, was shortlisted, went for the interview at the Embassy and was selected to represent Singapore for this exchange. Although the official statistics are not known, during the graduation ceremony at Washington, DC, the officials shared that the Spring 2017 application which just closed had well over a thousand applicants. The Fall 2016 batch I was chosen for was hosted by the University of Nebraska at Omaha (UNO) and had a total of 21 YSEALI Academic Fellows. The quota of each country is based on population size, and hence I was the only Singaporean in that group! Justine with delegates from Brunei, Laos, and Malaysia. Who were your fellow participants from ASEAN? What was it like sharing the experience with them? When we were there, everywhere we went, they announced us as “the best and brightest minds of ASEAN”. Most of us would just giggle and feel embarrassed. But I would say that the other young ASEAN representatives in the programme were not only intelligent and sharp, but also had very big hearts for their community and countrymen. Our batch was made up of a diverse group of delegates with backgrounds; we had a doctor, a pharmacist, a lawyer, a journalist, a teacher, a social worker, a social entrepreneur, a human rights activist and more. Although most of us had different careers and goals, we all had a common drive to build a stronger society, region and world. Be it through healthcare, legal rights, social campaigns, journalism, education or advocacy, all of us united and agreed that there was a need to build a stronger ASEAN identity and continue strengthening our regional relations and maintaining the peace in ASEAN. What did you learn? What were some of the key things for you that you can apply to what you do in Singapore? The theme was Civic Engagement. We had lectures from Professors at the United Nations Organization, and also multiple dialogues and field trips to government offices, NGOs, newsrooms, etc. Basically, we learned about how different organizations in the US play a part to build civic engagement. On the edifice of the Nebraska State Capitol building was a quote that summed up what I observed during this five-week long programme: “The Salvation of the State is in the watchfulness of the Citizens”. The burden and responsibility of a nation, state, civil society group, corporation or even church should not just lie on its leaders or governing body, but on every person. Everyone has to take ownership to be a watchman to protect what we have. We stayed at multiple locations throughout the trip at different cities. Most of our time was spent in Omaha. Next we headed to one of my favourite parts of the trip was the homestay in Scottsbluff, Western Nebraska with an American family, the Laceys. The wonderful couple Gayle and Kent hosted five of us with such warmth and hospitality. Probably the highlight of my trip was our last night there, where they grilled for us premium Nebraskan beef steak and baked their home recipe cheese tart. It was quite divine. On the last evening before dinner, Gayle offered to pray for each of us. Her prayer really blessed me a lot. This poem helped me to accept that no matter what I do, I cannot please everyone. But there is one thing I can do: every day, I have the choice of giving my best in everything I do. That is my responsibility; to live out the calling God has for me in faith and honesty. I am thankful for the network I have built through YSEALI. This was perhaps my greatest takeaway from this trip. Spending five weeks in close proximity with the same group of people has created a really strong bond amongst us. It was a privilege for me to meet and befriend all these movers and shakers of society. I came back to Singapore so charged up and inspired after rubbing shoulders with giants and undoubtedly future leaders of nations. You were in the US during the presidential campaigns of Trump and Clinton. What was that like? Being there in the midst of the US presidential race, I had the opportunity to hear various political views of the Americans I met. The exposure taught me to keep an open mind and to see things from multiple angles before drawing a conclusion. This is something I still try to remind myself while I make decisions on a daily process. I also had the chance to visit various levels of the American education system, from elementary school, high school all the way to college. I sat in their classrooms to observe their learning process. Whenever the teacher or professor asked if anyone had questions or thoughts to share, a sea of hands would be raised. There, participation and engagement is a lot more prevalent than here in Asia. And though there were differing views, every person’s opinion was respected. The freedom of speech and openness in sharing new thoughts and ideas were welcomed, it is therefore not a surprise that so many innovators are birthed forth from this kind of environment. This was something I felt we should encourage in our society. Allowing education to be multi-dimensional rather than one-way teaching. 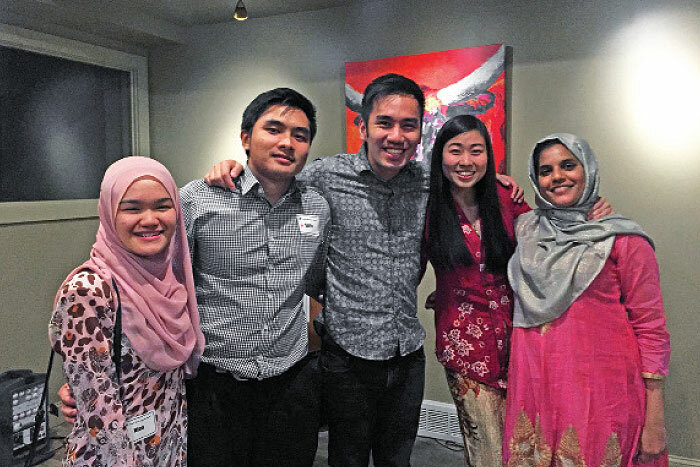 What’s next now that the YSEALI Academic Programme is over? After graduating from the YSEALI Academic Programme, we are invited into the Alumni Fellowship, which is a platform for us to continue participating in US-ASEAN civic engagement events. In 2017, my aim would be to finish strong for my postgraduate Master Programme in Community Leadership and Social Development, after which I will have decisions to make both professionally and academically. But for now, I am just focused on my next step, which is to excel in academia, to learn as much as I can and apply it to my daily work. My hopes for Soule is that it will not just be a social enterprise brand, but that people will recognize that there is a deeper message behind it, which is to raise awareness about social need and education. Soule’s aim will continue being humanitarian-focused. To provide a sole for every soul, not just for our beneficiaries, but for everyone who hears about us. My hope is we stay humble, with our feet on the ground, even we continue chasing our dreams.